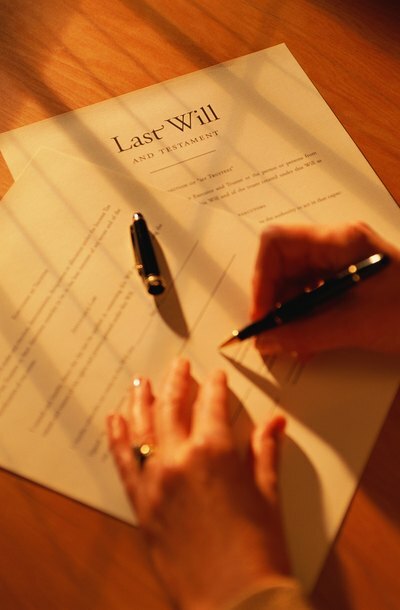 A last will and testament is a legal document that directs the probate court and the executor, who is named in the will, how to distribute estate assets. The person who makes the will, known as the testator, must be at least 18 years old and must understand the contents of the will and its legal significance. The testator must sign and date the will in the presence of two witnesses, both of whom must be mentally competent and at least 18 years old. The probate estate consists of all of the testator's property including real estate, personal property, bank accounts and intangible property such as copyrights. The executor is responsible for paying estate creditors and distributing the remainder of the estate to heirs. All estate debts must be paid before any property can be distributed to heirs, even if this results in estate heirs receiving less than the amounts specified in the will. Probate proceedings begin when someone submits the will and the testator's death certificate to the probate court. The court then schedules the first probate hearing. At the first hearing, the probate judge appoints the executor named in the will, or an estate administrator if no executor is named, or if the named executor is unable to act as executor. The judge then determines whether probate is to be supervised or unsupervised. Large or complex estates are more likely to be supervised. If probate is supervised, the executor must file reports with the court to list the assets of the estate and report his administration of estate property. The court may hold additional hearings if anyone disputes the validity of the will or makes civil claims against the estate. The executor must distribute a living allowance to the testator's minor children and surviving spouse during the probate process. He also pays estate creditors, files any estate tax returns that come due, and distributes assets to the testator's heirs from whatever assets remain in the estate after creditors have been paid. If there is no will, or if the testator's will is declared invalid, the probate court orders the executor to distribute estate assets in accordance with the District of Columbia's intestate succession rules. These rules award the largest share of the estate to the testator's surviving spouse or domestic partner -- if any -- and progressively smaller shares to the testator's descendants depending on how closely related they are to the testator. If a descendant or a parent does not survive the testator, the spouse receives 100 percent of the estate. Assets deposited in a living trust by the testator before his death are not subject to probate jurisdiction; instead, the trust administrator distributes assets as directed in the trust deed. If, on the other hand, the trust is created by the testator's will -- known as a testamentary trust -- trust assets are included in the probate estate.